Akili Lee is lead creator of the iRemix platform, a customizable cloud-based social learning network for primary and secondary education. Currently in private beta, iRemix serves 10,000 users from select schools, libraries, museums, and youth programs across the nation. Once organizations enter into a license, a hosted iRemix social learning network is created for them where they can customize a rich set of learning and social features, which range from an integrated badge infrastructure to embedded artifact based rubrics to debates and a leaderboard. IRemix is based on research from the Digital Youth Network, a digital literacy program for Chicago youth that encompasses both in-school and out-of-school education settings. As Co-Founding Director of DYN, Akili helped define the key components of the organization’s model to support youth in developing digital skills across settings, including the classroom, at home, and in social spaces. 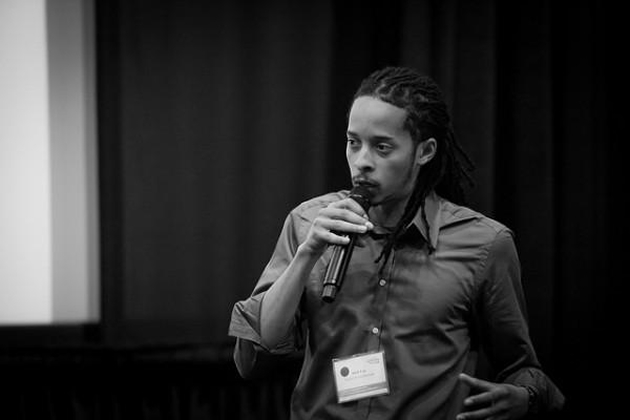 As current director of Digital Strategy and Development of DYN and Co-Founder & CEO of Remix Learning, Inc., Akili creates digital learning tools and helps youth focused organizations develop models for integrating digital media as a way to increase engagement. We spent a few moments with Akili to discuss how his team at Remix Learning is designing robust social learning features that best support today’s networked youth. “We are the platform for education in the 21st century” is the tagline for Remix Learning. What defines a “21st century education platform”? When we think about learning in this newer age, the first thing that comes to mind is that learning is inherently a social thing. A 21st century education platform takes into account who you are, where you are, what you care about, and what skills you acquire. It recognizes that the pathways available to you can be formed by who you are and at what point you are at in the learning stage. Traditional social networks do a lot in terms of visibility and building a community around identity and interest. How do you want to be perceived? What do you want to achieve? How do you reconcile identity within different contexts of community? But these social networks in which the youth are most active do not come with the same intentionality around how people learn because it is a purely social thing. These networks are not necessarily designed to create explicit learning opportunities or facilitate any type of self–directed learning. In creating a 21st century platform, we take these benefits that we see in traditional social networks and fold in a whole other set of interactions, functionalities, and features that really help speak to learning. Today’s educators are ambitious in terms of learning outcomes but are often constrained by space and time. Social learning networks provide them the space to connect with other students and mentors from their physical workshop on a daily basis. Our platform recognizes the critical nature of the mentor, and it is our priority to ensure that the social capital the mentors have with the students smoothly transfers to an online space. When youth see the work of their peers or mentors online, it allows for more opportunities of connection around specific interests, which drives more skill development and more production by the kids. Michael Lachney, a DYN mentor whose students’ online participation skills and engagement levels increased as a result of using our platform, writes about these learning opportunities on his own iRemix blog. Can you give an example as to how social learning networks lay a foundation for teachable moments? Our program does not just focus on teaching youth production skills but also how to critique, deconstruct and develop a critical lens. In our early days, we had a brother and sister who were three years apart both come through DYN. They had gone to see a movie where an actor was performing in what the girl found to be a very stereotypical manner, which made both of them uncomfortable because the mixed-race audience was poking fun at the character’s actions. What happened was very powerful. Her immediate response was to take it to a broader audience. She already had a social community online where they discussed issues of identity so she created a blog and leveraged that community to have the opportunity to have a serious discussion with peers and mentors about how stereotypes play out in the media. Suddenly we had 6th-9th graders chiming in and discussing sophisticated issues around social dynamics. What would have been a teachable moment contained between the brother and sister became transparent because she went to this larger online community, and because everything is archived online, that discussion doesn’t disappear. Someone could find it a year later and chime in at that point. The benefits are more long term than if that conversation had been confined to a classroom. This distinguishes social learning networks as not only spaces for discussion but for reflection as well. How does iRemix’s walled garden approach adapt to students’ desires to share their content with external social networks? We understand there is a larger ecosystem of social networks that youth are active in every day. There comes a point when some things created in that space ideally need to be shared with a wider audience. No two classrooms or after-school settings are alike. Network administrators have the ability to toggle on/off a sharing functionality to assure this integration is appropriate for their community. There should be a lot of recognition at the high school level that students are very active on other social platforms, but at the middle school level – where most youth are under 13 – a network administrator may not want to encourage them to be as active outside the network. Students need to be cognizant and intentional around why they make certain things public for individual networks. The iRemix platform puts the power in the users’ hands so they can make those decisions in the most informed ways. If a kid has produced 20 videos on iRemix and wants to push them outside his/her social learning network, he/she simply clicks “push to web.” With this he/she is saying, “I am OK with this content being visible beyond iRemix.” Doing this does not give any outside person any more access to iRemix than he/she would have had otherwise. We also break down these walls through our badges infrastructure, which allows youth to push the badges they’ve earned in iRemix out to their Mozilla backpacks so they can share with their friends and family a representation of the specific skills they have developed in our program. Some people have questioned whether systems of badging for learning focus too much on extrinsic motivation. How does the iRemix platform address this concern? Badging is not the whole of the system. There are youth in iRemix who have been engaging in this type of work without any badging system in place. Badging allows the mentors to show some more clear pathways for how they can further explore their interests. It’s not a motivator in terms of a gold star. Badges can and should connect to each other. For instance, network owners can create a trajectory of badges, and even if a kid isn’t aware he/she is going down a specific trajectory, earning that first badge tells the kid about other related badges. Badges are a really good way to unlock new learning opportunities because it isn’t just a marker representing a skill the student has developed, it’s an opportunity for them to discover new related activities to continue going further down that path. If a kid earns an intro video badge, not only is he/she receiving recognition, but the system opens that kid up to other youth in iRemix who have earned the same badge. That kid can now meet new youth, discover their portfolios, and connect with fresh content. We can’t place these open systems out there and expect youth to be able to navigate it on their own and always know what their next steps are. Badging gives them the flexibility to try new things while laying out that path to further navigate the system. It’s a way to represent their interests and expertise within their social learning network and across the web as well as an opportunity to help youth navigate a multitude of learning opportunities at their own pace. What do you tell a teacher who wants to use iRemix but doesn’t know where to start? An educator can value the social and community aspects of learning and be willing to dive into social learning networks, but it doesn’t mean it is going to be an easy thing to do. Figuring out how mentors should interact online to best support students and understanding how to create the intersection of the physical classroom activities with the online space are not necessarily intuitive practices. Even in this digital age, people have one established mental model around social networks. Learning can happen in these online spaces, but we are not at a point yet where most people can articulate why it happens. We help them articulate how they can create those spaces and drive those interactions. It’s not just taking iRemix and recreating Facebook, but creating another model of what social networks can be and do to support learning. Having emerged from the Digital Youth Network, we have a unique footing to know what specific challenges come with implementing a social learning network. We are not only creating the platform, but we are working on the ground level to devise a set of supports for the educators so they can have a custom approach to use these platforms. We dive into their curriculum to determine how to find those points of integration into their classrooms. We help them understand the affordances of the platform being used and help establish a set of best practices for their mentors. Teachers are most often our best advocates. When they are passionate about our platform but need to sell someone else on it, it’s our job to come to them with these packaged success stories so we can empower teachers to bring those messages back to their own spaces. Learning is a two-way street. What has been the most important lesson you’ve learned from your students? It might sound corny, but it has to be to keep creating. Not one of the jobs I have had since I graduated college a decade ago existed before I entered college. I never could have planned out how to get here. Thanks to my parents though, I always had access and encouragement to dive into the things I was passionate about – for me, that was always technology and the arts. Turns out that was a great combination. A student of ours who went through our middle school program and into YOUmedia is going to college next year on a full music scholarship. I remember him bouncing off the walls as a 6th grader, but he was really passionate about doing music production. He was all over the place, but the passion for creating and the passion for music stuck with him. He now sees that by producing his own music, he’s furthering his academic opportunities through a college scholarship. Careers really play out based off of youth exploring their interests. A kid can take those music skills and bring it into the classroom, an after school space, or use them to explore job opportunities. A big part of our job is providing that access, support and encouragement and helping them make those connections to make the most out of those things they’re passionate about. If you are interested in the iRemix social learning platform for your school district, after school program, library, or museum please visit http://remixlearning.com/contact/.